DIARY OF A PUBLIC SCHOOL TEACHER! : Beginning of the Year Student and Parent Questionnaires using Google Forms! I got the idea to create student and parent surveys from a teacher on Twitter a few years ago. I used to create them on paper, and then I was introduced to Google forms. Love it! The student survey questions I use are more of a way to get to know my students. Last year, I posted it on our class website, and called it "Getting to Know You.". I will continue with that tradition because it worked well.The students completed the questionnaire on the first day of school. The parent survey asks for basic information, but then I try to get them to tell me something about their children and what they want from me. I keep the questionnaire for parents very short because I know how they feel about their time. I have posted it on our Weebly page, and I will also send home an email with the link, and a written notice asking them to complete it. I really enjoy using Google Forms because they are so easy to edit and share! Between now and the time school starts, if I come across questions someone else used, or think of one myself, and want to change it, it can be done in a flash! If you find you don't like your theme, change it! No fuss, no muss! They also give you insight into your students. 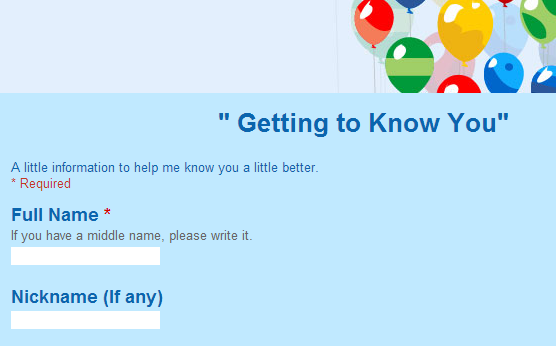 I went back and reread last year's class "Getting to Know You" when I was creating the new one. It's funny reading it now that you know the kids. Below are the links to my student and parent questionnaire forms. Looks like a great idea. I've never used it before. Does it have any collating abilities? Can it analyse any data that comes in? Yes it can That's another way I have used it with the students during the school year.